"Absolutely fantastic. This is one of the most exciting young reds I have tasted in a long, long time. It shows intense aromas of berries, currants and minerals, with hints of mint. 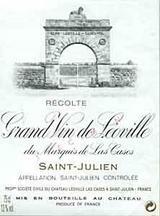 Full-bodied and packed with fruit and tannins, its long finish is refined and silky. A benchmark for the vintage. Las Cases has always wanted to make first-growth quality in a top notch vintage, and it certainly did in 2000. Best after 2012." Full, bright ruby. Superripe aromas of roasted currant, violet and black licorice. Powerful and highly aromatic in the mouth, with brooding black fruit, violet and chocolate flavors. A step up in acidity from the Clos du Marquis, giving the wine great vinosity and cut. Extremely long and aromatic on the finish, with big, chewy, thoroughly ripe tannins. 95(+?) points.